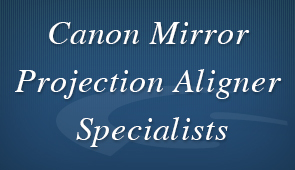 SERVTECH Inc. has been providing the most comprehensive Mirror Projection Aligner and Canon Stepper services available outside the OEM since 1994. With extensive domestic and international experience, SERVTECH is a world leader in sales, service, training and support for pre-owned or used Canon Steppers, including the Canon FPA-3000 i4, iW, i5, i5+, i5++ and FPA 3000 EX3, EX4, EX5, EX6 series Steppers. We are also an established solution for refurbishment, sales, parts and service of used Canon MPA-600FA/Super and Canon MPA-500FAb Projection Aligner systems. SERVTECH Inc is a fully insured company, with a steadfast commitment to honesty, reliability and responsive customer service. Our team of Engineers are Canon factory trained and have more than 70 years of combined experience. Contact us today to find out how SERVTECH can help insure you maintain your competitive advantage. System can be purchased refurbished or "as is" with optional installation and warranty services. Email sarah.dean@servtechinc.com for additional information.